Yuri, why is caffeine bad for you? That’s a question I get asked all the time when I tell my clients to give up their morning coffee or caffeinated tea. 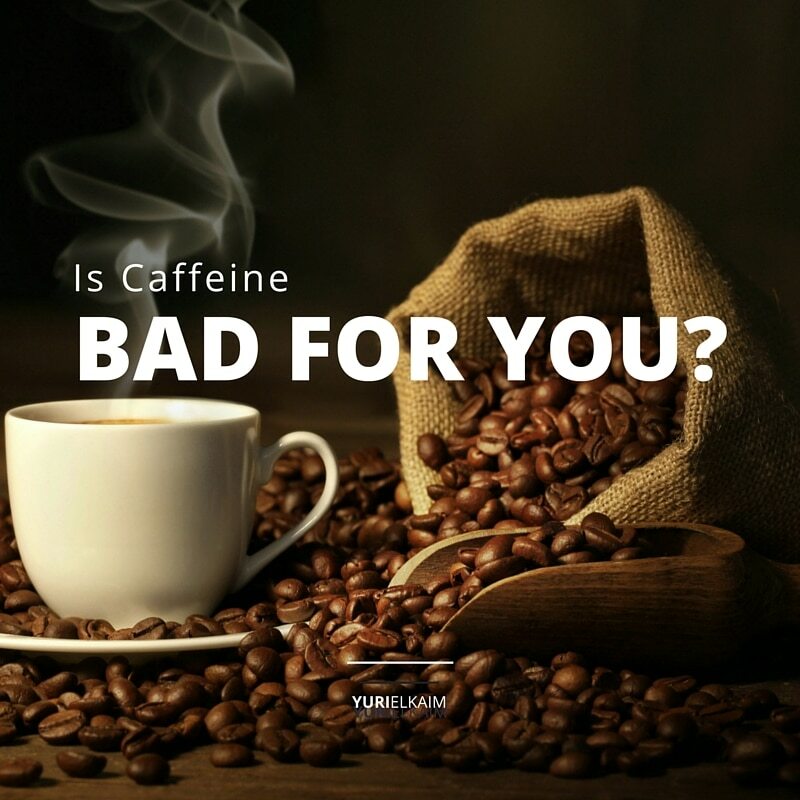 To me, it’s a complete no-brainer yet for so many people that are addicted (yes, addicted) to caffeine it often feels as though they’re giving up the one thing that makes them happy. Or that it improves brain function (heightened alertness, etc…). Well, in the latter case, so does cocaine. The first thing you need to remember about caffeine is that it’s a DRUG. In fact, it’s the world most popular psychoactive drug! It’s a stimulant which primes your central nervous system (CNS) into action – also known as the “fight or flight” stress response. Why does it make you feel so good (at least temporarily)? It stimulates the adrenal glands to pump out adrenaline and cortisol (the same response that happens when you’re feeling stressed or faced with a threat). It temporarily blocks the action of adenosine on its receptor which prevents the onset of drowsiness that adenosine normally induces. I’ll discuss the long-term detriments of the first mechanism in just a second, but first let me show you why caffeine is really no different than alcohol or any other drug addiction (ok, perhaps not as deadly in terms of eventual health outcomes). Lack of control over the amount you consume. Loss of interest in other activities that you once enjoyed. Devoting increasing amounts of time to using the substance. If an individual experiences three or more of the above symptoms within a 12-month period, it indicates they have become dependent on this particular “drug”. Now, I’ve highlighted 4 items above (in asterisk) which are classic symptoms in those who drink coffee or caffeine. Do you feel irritable or cranky when you don’t get your “fix? Do you go into withdrawal (headaches, etc…) when you don’t drink coffee or caffeine? Do you need more coffee than you originally did (when you first started drinking it) to feel its “awakening” effects? Will you continue to drink it in spite of what you’re about to learn in this post (and elsewhere)? If so, then you’re addicted to caffeine. The sad part is that, more often than not, when you give up caffeine and follow healthier, more sustainable eating (or drinking) habits, you end up feeling 100x better than when you drank the coffee. It’s as if you’ve finally seen the “light” and really know how good you can feel without relying on a short-term stimulant that wears your body down over time. Most people are heavily indebted and that’s because they’re borrowing money from tomorrow (ie. credit card) to pay for stuff they want today. The rise and fall in your energy levels when you rely on caffeine. As I mentioned earlier, excessive stimulation and stress cause your adrenals to release adrenaline and cortisol—two catabolic hormones, which break down your energy reserves for immediate use. Remember, your body thinks it’s in a state where it needs to fight or flee—so it needs that readily available energy. When chronically elevated in your bloodstream, cortisol is a detrimental hormone, leading to quick glycogen (stored carbohydrates) depletion, a rise in blood sugar, and eventually weight gain (especially abdominal weight gain). And even when it’s less present (adrenal fatigue), epinephrine picks up the slack, yielding the same problems. Adrenaline (epinephrine) has similar energy-depleting effects. Initially, however, it gives you that feeling often described as a “natural high” or “caffeine rush,” because it temporarily increases your heart rate, breathing rate, blood pressure, and carbohydrate breakdown into blood sugar. Within a few minutes you feel alive and ready to take on the world. But that quick surge in energy is soon followed by a debilitating crash in which your body does its best to recover from the stressful situation, whether it’s your morning coffee or a near fender bender on your way to work. Having these two hormones chronically circulating in your blood is not a desirable situation, but this only occurs up until the threshold where your adrenal glands can no longer keep up. Once you reach that point, say hello to “adrenal fatigue” in which case there is less and less hormonal output and you’re unable to cope with even minor stresses on a daily basis. …down, especially when stimulants are involved. The initial feeling of mental alertness and energy that a hot cup of coffee brings on is almost always followed by a dreadful crash as your blood sugar plummets and your adrenals do their best to recover from another bout of acute stress. For most people, the “solution” is another cup of coffee, or maybe a caffeinated soda or an energy drink. It too is followed by another crash. By the end of the day, you’ve been up and down on this seesaw. If this process repeats itself day in and day out, it’s only a matter of time before your body breaks down. There’s no amount of coffee that can perk you up from that. Caffeine simply masks what’s really going on inside your body and temporarily gives you a false sense of feeling alert and productive. It’s a Band-Aid solution that will never give you the lasting energy we crave. Caffeine stimulates your adrenal glands to pump out adrenaline and cortisol. These 2 “stress” hormones run around your body and break down stored energy into blood sugar for immediate use (remember, your body thinks it’s “fighting or fleeing” so it needs readily available energy). Naturally, the more you breakdown stored energy into blood sugar, you will suffer with high and low blood sugar fluctuations, which leaves you feeling like you’re in a coma at its lowest points. The more you elevate your blood sugar, the more insulin is released to remove excess sugar from the blood and bring things back under control. The more insulin you have circulating in your blood, the more cortisol is released, and the more inflammation is created inside your body. Eventually, you can develop reactive hypoglycemia (very poor regulation of blood sugar) and eventually insulin resistance (or type 2 diabetes). I’m not saying that caffeine causes diabetes but it starts a cascade of events that are very unfavorable when repeated day-in and day-out for years or even decades. When your body can’t manage blood sugar properly you feel the constant need to eat sugar or drink caffeine. And when you do, your blood sugar reacts like a hyper-reactive teenager. It’s the same underlying process involved in how sugar cravings develop. So, if you want to feel good and avoid those afternoon lulls that do nothing more than crash blood sugar, then please put aside the caffeine and choose healthier alternatives which I’ll highlight below. If you must drink coffee, switch to Swiss Water Decaf, which is a decaffeination process that doesn’t involve chemical solvents and is obviously much better for you. If you don’t want to do decaf, at least taper down on the caffeine. So, if you’re having two cups of coffee a day, go to one cup of coffee a day for one week or two weeks. Then taper it down from there to half of cup of coffee, and taper it down like that until you no longer require it. If you drink black tea switch to herbal tea like peppermint, holy basil, or others that don’t contain caffeine. And yes, green tea is chock full of antioxidants but it’s also loaded with caffeine. I personally never drink it. If you want more energy, realize that your body operates when it’s well hydrated. So drink more water. First thing in the morning drink about half a litre to a litre of water, that’s a great way to start. Then continue that throughout the day and you’ll start feeling so much more alive. If you have a juicer or blender PLEASE start your day with a green juice or green smoothie instead of coffee. Just making this one simple swap will transform how you feel (and how you look) very quickly. Energy is my bread and butter. I know this topic like the back of my hand and that’s why my book The All-Day Energy Diet became a NYT bestseller. Sometimes I feel like I’m living in the Twilight Zone where nonone seems to understand how good they can feel without coffee or caffeine. But I can tell you with 100% certainty that you WILL feel so much more alert, more refreshed, and more alive when you opt out of caffeine and switch to alkalizing your body with green veggies – in juice or smoothie form. Heck, it’s also the reason I developed my Energy Greens – to give you a quick 30-second alternative to having to juice produce every day. There are properties in green vegetables that do things internally to really give you the all-day energy you’re after. It’s not the one hour of energy followed by a crash that you get with caffeine. Energy through nourishment, not stimulation. If you’re unsure how to get started with your new energizing routine, then be sure to download a FREE copy of my Perfect Green Smoothie printable below and get the exact blueprint for creating an energizing green smoothie that will keep you going for hours and feeling great! Is Apple Juice Worse Than Coke?